Underground Elephant’s brand new headquarters, located in East Village’s warehouse district, was recently nominated for a San Diego Architectural Association Orchid Interior Design Award. 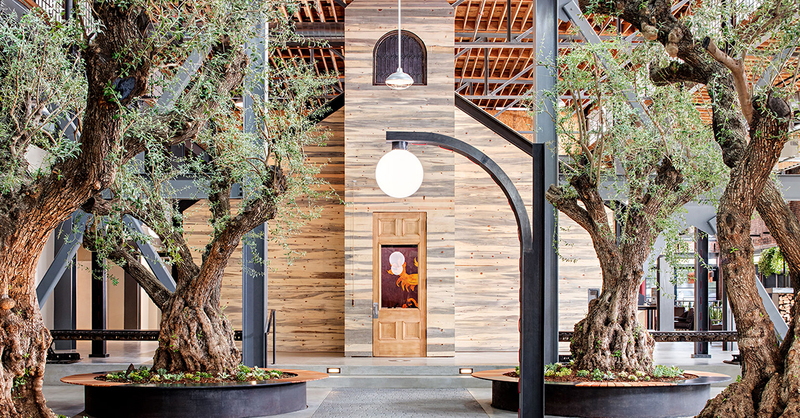 Designed by Basile Studios, Underground Elephant’s office is being recognized for it’s unique warehouse office concept, which is complete with an indoor schoolhouse, five 100-year old olive trees, a multitude of collaborative meeting spaces, and local art installments. Orchids & Onions is a non-profit organization “dedicated to the education and the promotion of outstanding architecture, planning and urban design,” holding annual awards ceremonies that highlight San Diego’s greatest community achievements in architecture, design, and historic preservation. Other nominated projects this year include restaurants, apartment buildings, open plazas, and schools throughout San Diego county. The Orchids and Onions award ceremony will be held on October 13th at Spreckels Theater, with a reception at the newly opened Horton Plaza Park, which has also been nominated for an award in the Historic Preservation category. To read more about Underground Elephant’s nomination and see the other nominated projects, click here.